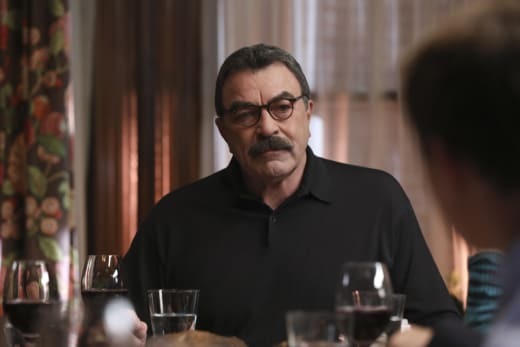 Trust and loyalty were at the core of Blue Bloods Season 8 Episode 16. Some questioned it, other earned it, and a few lost it completely. The murder victim at the center of Danny and Baez's investigation was perhaps the worst of the bunch. Jack Thompson lied to everyone. His wife, his multiple kids, and his fiance and new baby, but I had to give him credit for keeping his double life within a certain geographic proximity. Jack had one family on one side of Central Park, and the second on the other. The locations of each family were definitely convenient, although it did lead to his demise. The residences were so close together that his teenage son spotted him with his fiance and baby daughter. Oopsie! Those homes also left me with questions. First off, what did Jack, his wife, and his fiance all do for a living, because those apartments near Central Park cost a fortune? Second, did Jack ever really go to London? I originally thought he told Janet he was headed overseas so that he could spend time with Lindsay, but it sounded like Lindsay thought Jack was in London too. So was he gone and then he came back? How long was his body in the park before Buster, the dog, found him? And how did his son, Trevor, know where to find him and when? I thought that Baez and Danny really dropped the ball when they didn't suspect Janet's confession came a little too easily. The moment she admitted to killing Jack, I knew her son did it. There's no other reason to confess that quickly and without a lawyer. I also couldn't believe that both Danny and Baez waited so long to call the burner phone. Wouldn't that be one of the first things to be done when they got the number? These two had their fair share of failures before they closed this case. Then their was Frank's issues with Chief Penworth. When Chief Cornick "lit a smoke bomb and hightailed it out of the room" during his interview for the Chief of Transit promotion, I was left trying to figure out if it was ballsy or weaselly. 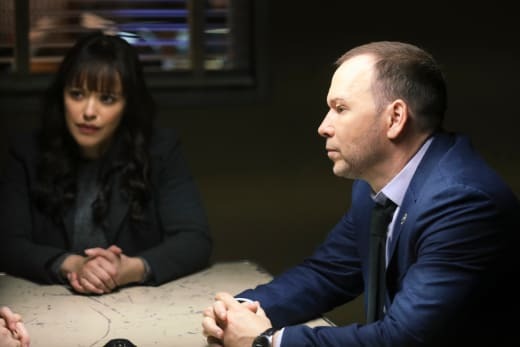 Once again, Baker stole the show by calling Garrett and Gormley the "two Gs" and completely upstaging them with her detective skills by coming up with the old newspaper interview where Chief Penworth lied about what he did in the military. I didn't expect to feel sympathy for Penworth, but I did. He came clean before he even knew he'd been caught, and admitted he'd said something stupid in order to impress his son. It didn't absolve the sin, but it helped explain it. As for Cornick, he just looked like a disloyal weasel willing to throw an old partner under the bus to get ahead. I can't imagine he'll ever get another promotion if Frank has anything to do with it. Finally, Erin and Anthony had a falling out over his old partner. Erin: You don't. Nobody knows anybody, Anthony. That's the one thing we all come to learn in this business. Anthony: He's a stand up guy, Erin. Erin: Well, he wouldn't be the first stand up guy to fall down. Permalink: Well, he wouldn't be the first stand up guy to fall down. I had to give Anthony credit for his loyalty. He was right, Erin may think she understands what it's like to wear the uniform and have a partner, but she'd never put her life in someone else's hands, day in and day out, the way police offers do. Anthony was willing to end his career rather than try and jam up a man he believed to be innocent. But everyone has a tell, and when Anthony realized that Fusco was lying, he was devastated and angry. I felt horrible that his friend had let him down so badly. We've seen more of Anthony in Blue Bloods Season 8 than we ever have before and I've enjoyed every minute of it. I enjoy his dynamic with Erin and hope we get to see more of it in the future. My one wish for this episode was that we had gotten to see the rest of this storyline, where Anthony helps Erin take Fusco down as a dirty cop. It seemed a shame that we never got that closure. At last, we get to the Reagan Sunday family dinner, and I'll make the same complaint I've made several times before...Sunday dinner is the only time we get to see Jamie Reagan. Sean: Can't we just be like a normal family and you guys just ask us about school or something? Jack: Or talk about the good things that happened this week? Jamie: Because there's almost nothing to learn from success. Failure, on the other hand, is the best teacher you'll ever have. I like that the Reagan family has learned to embrace their failures, but I wish the show would realize it's own failures, like when it delegates Jamie to a secondary character. If you aren't failing, you aren't trying, and if you aren't trying, you aren't really living. Permalink: If you aren't failing, you aren't trying, and if you aren't trying, you aren't really living. Sometimes it feels as though Blue Bloods isn't even trying to do Jamie justice. So TV Fanatics, did Frank promote the right man? Did you figure out the son was the killer before Danny and Baez, and did Erin put Anthony in a bad spot? 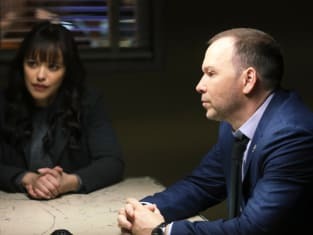 Check back for my review Blue Bloods Season 8 Episode 17, and you can watch Blue Bloods online here at TV Fanatic.